Poster presentation application form is closed. Click here for PROGRAM TABLE. Click here for DETAILED PROGRAM. Click here for POSTER LIST. In the Big Data era, high-dimensional data-driven science (HD3 Science) has attracted considerable attention. In natural science, highly advanced experimental and measurement technologies yield high-dimensional data intractable for conventional analyses based on researchers’ intuition. However, recent progress in information science provides a variety of methodologies through which the problems of high-dimensional data are addressed. The scientific principle of HD3 Science is to establish a universal modeling platform where the motivation of natural science is smoothly conveyed with high-dimensional data to information science. The previous meeting for HD3-2015 focused on “sparse modeling” as a principal component of the platform and its wide application to nuclear magnetic resonance spectroscopy in chemistry, magnetic resonance imaging in medicine, and astronomical interferometry in astronomy. The scope of this HD3-2017 meeting is the latest development and future perspective of HD3 Science. Sparse modeling is effective for extracting explanatory variables and interactions from complex systems and has broadened its horizons to include planetary, geo, and life sciences. In addition to experimental science, computational science, such as molecular dynamics in life science, ab initio calculation in material science, and computational fluid dynamics, may provide another testing ground for HD3 Science. Hierarchical modeling technologies will be essential for relating experimental and computational high-dimensional data to reveal multiscale phenomena. HD3-2017 offers a forum where diverse viewpoints are brought together to strongly promote HD3 Science. September 10th – 13th, 2017. 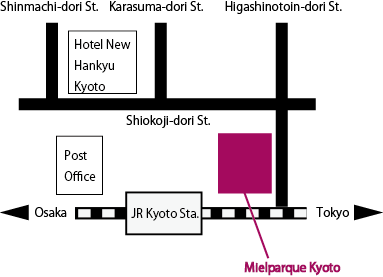 The conference venue is 1 minute walk to the east from Karasuma Exit of JR Kyoto station. In the following please find the access from airports to the station. Approx. 75 min by Airport Express HARUKA. Approx. 80-100 min by Airport Limousine (Bus). Approx. 55-60 min by Airport Limousine (Bus). Copyright© Initiative for High-Dimensional Data-driven Science through Deepening of Sparse Modeling. All Rights Reserved.